Heute morgen um 6:30 Uhr gab es mehrere Verhaftungen und Wohnungsdurchsuchungen durch die, „Brigade criminelle“ vom 36 quai des Orfèvres. Es sind mindestens fünf Personen verhaftet worden (vielleicht mehr?) und es scheint als würden die Bullen weitere Personen suchen. Heute Abend sind die Betroffenen immer nochin Gewahrsam. Ohne die Anklagepunkte genau zu kennen, kann davon ausgegangen werden, dass die Verhaftungen eine Antwort auf das, vor drei Wochen in den Medien aufgepuschte Thema sind. Am zweiten Prozesstag gegen die im Fall des Brandes des Abschiebeknastes von Vincennes Angeklagten, beschuldigten einige Zeitung die „Ultralinken“ der Zerstörung von zig Bankautomaten, an Einrichtungen, die regelmässig „sans-papiers“ gegenüber den Bullen verpfeifen. 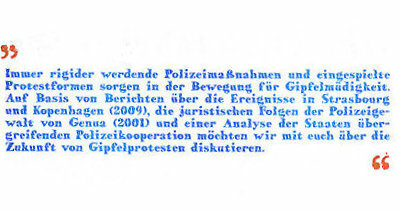 Während den Durchsuchungen schienen die Bullen besonders an Flugblättern mit Bezug auf die Kämpfe der „sans-papiers“ und gegen die Abschiebungs-Maschine. Kleidung, Computer und Handys wurden beschlagnahmt. LASST UNS FRANCK SOUCI BEDRÄNGEN (Offizier der sich um den Fall kümmert). RUFT AM 36 QUAI DES ORFÈVRES AN: [(+0033)] 01.77.72.01.17 UM DIE BEFREIUNG UNSERER GENOSSINNEN ZU FORDERN. UM WEITERHIN GEGEN DIE ABSCHIEBE-MASCHINE ZU KÄMPFEN, GIBT ES MORGEN, DIENSTAG DEN 16 FEBRUAR, UM 17:30 UHR EINE VERSAMMLUNG AM MÉTRO CHÂTEAU ROUGE. OB MIT ODER OHNE PAPIERE! Friday night, Alexandre Varga pulled out a knife and took hostage a guard. He forced the other guards to open alle doors of the prison. When Varga came out of the prison, the guard taken hostage was able to run away thanks to the other guards who were following Varga. Varga started to run, but was caught very fast. A day later, after that the guards placed Varga in the isolation unit and after that the guards declared to make a strike of 48h against the „violence of the prisoners“, Varga was suicided in prison. He would have hung himself. Every death in prison is a murder of the State. Alexandre Varga was condemned to 18 years for several robberies, one on a supermarket and some others against money transports. In 2008 he appeared in front of court with an orange shirt with „GUANTANA-MONS“ to denounce the mistreatements of psychiatrical prisoners by guards in the prison of Mons. N1N1 was arrested in Hongaria in October, and put in prison there. He was then identified and deported to France on October 16th. Two judges received him, and decided to imprison him in La Santé, in Paris, for undeterminated time. He ’s released on Decemebr 11th. He’s free now, under judicial control, as all the others. Police say he fled after Chambery events. Zoe died when trying to make a bomb, and Mike seriously injured on April 31st. Then Police made than a house-research on Les Pilots squat, in Chambery, saying « she has been seen there several times ». 10 people were arrested and released, but Raphael was kept. After several days, Lucas was also imprisoned. He presented himself to police when he saw they were anyway arresting all the friends « for investigations ». All these people were of course under anti-terrorism conditions. About the repression in France you can read „Solidarity & Revolt Across Borders – Letters from prisoners, solidarity statements and action chronologies from France and other countries (January 2008 to March 2009)“ in english. Two prisoners, from Ensisheim prison, take in hostage a guard inside the prison. This situation last several hours. The two prisoners are presented on Friday to the judge. They were already condamned to 18 and 13 years of prison. Du browst gerade in den Weblog-Archiven nach der Kategorie 'France and Belgium'.